Many of the N-plant workers, fully aware of the breaching of rules and procedures set in place for the decontamination work claimed they were simply following orders from those above them on the basis that following nuclear waste disposal rules to the letter meant they would never complete the decontamination work. They also claimed that they were ordered as regarded the sites that monitor radiation, to merely sweep up around them and that was to be all they should do. The government has committed 650 billion yen ($7.4 billion) to clean up the surroundings in contaminated towns and villages. The Environment Ministry engaged Japans most prominent contractors, the Taisei Corp who have a 7.72 billion yen contract in Iitate, and the Maeda Corp who have a contract in Naraha to the value of 18.82 billion yen. Infrastructures, highways and farm land will have radioactive substance sited within 65 feet of their location stripped away, if the objective is realised. 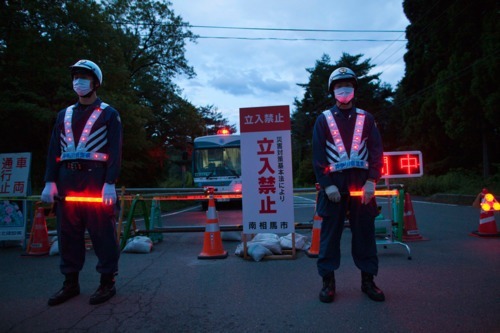 The Japanese government now plans to take tough action on the corrupt practice alleged to be currently in place around the Fukushima nuclear plant, and residents in surrounding areas have secured an apology from Senior Vice Environment Minister Shinji Inoue. 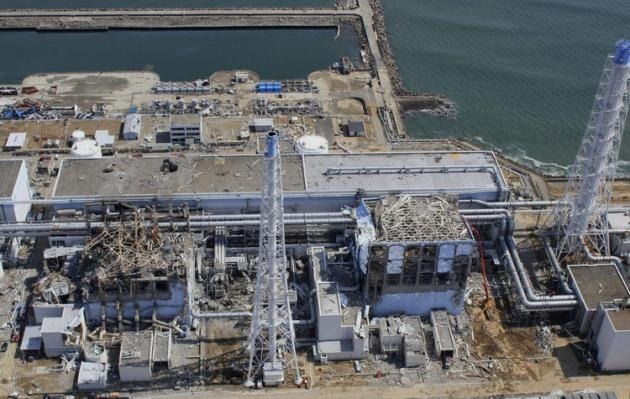 The Rice University of Houston and the Lomonosov Moscow State University has generated exciting new research that suggests that there may be a way to use graphene, to reverse the disastrous environmental impact at the Fukushima Nuclear Plant. **Graphene is a substance made of pure carbon. Its atoms are arranged in a similar way to graphite, but in a very light sheet only one-atom in density. It’s been suggested that Graphene could also be a highly significant factor in increasing the efficiency of the desalinization process, in flexible semi-conductors, and the improvement of electronics. Processes based on graphene could also be useful in the cleaning up of the natural gas industry, and if this report proves successful, it could play a very important role in the nuclear waste clean-up. The researchers involved say that when graphene oxide flakes are introduced to contaminated water, the result is the condensing into clusters of the offending radionuclides. They can then be split away and securely disposed of. "Graphene oxide introduced to simulated wastes coagulated within minutes, quickly clumping the worst toxins," Chemist Stepan Kalmykov. Thousands of Japanese residents have been forced into homeless and it could take decades to clear all the contamination and complete the clean-up. Even then some towns and villages may have to be abandoned forever. 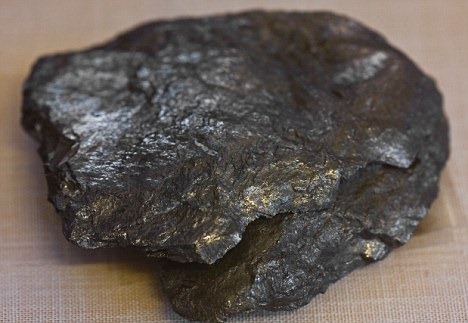 ** Graphene is made by chemically processing graphite — also found in the ‘lead’ of pencils. 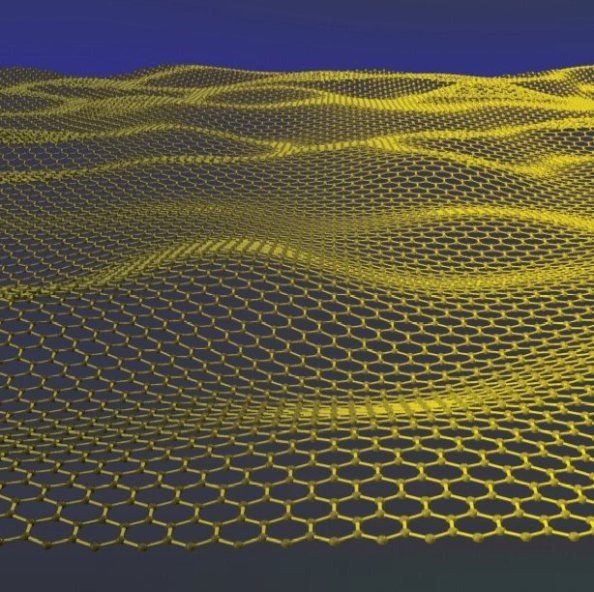 A sheet of graphene is just a single layer of carbon atoms- one of the most abundant materials on Earth, an individual layer of crystalline graphite -locked together in a strongly-bonded honeycomb pattern. Flexible, translucent and the most ultrathin material ever made Graphene is also the strongest substance known to mankind — 100-300 times stronger than steel and several times tougher than diamond. The best heat conductor known to man and better at conducting electricity than silicon, with its unique optical properties. 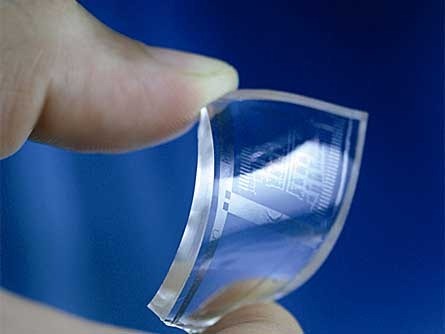 Graphene has caused a dramatic surge in research and potential applications for the material. An inherently sustainable and economical technology, Graphene could lead to roll up behind the ear mobile phones , paper thin HD televisions, and fold away into a tiny square, bendy electronic newspapers. It could transform the medications we use, and replace silicon which is currently used in the creation of the chips in our computers. It is also possible that Graphene being such a bendy substance could replace existing touch-screens materials for devices such as tablets making the likes of the i-pad as out-dated as anything else in ancient history! US Astronomers at the California Institute of Technology (Caltech) have discovered that the dwarf planet 2007 OR10 known as Snow White –once a small volcanically active world firing slushy water ice from ancient volcanoes, and boasting an atmosphere, is today an icy, frozen, dead world, tinged red and enveloped in a thin layer of methane that is slowly slipping away to be lost into space. Snow White — orbits the sun at the edge of the solar system and is about half the size of Pluto, making it the fifth largest dwarf planet. Part of a larger group of icy bodies called Kuiper Belt Objects (KBOs).Ironically Snow White has actually proved to be one of the reddest objects in the solar system. However last autumn using a newly designed instrument called the Folded-port Infrared Echellette (FIRE), with the 6.5-meter Magellan Baade Telescope in Chile, Adam Burgasser, a former graduate student and now a professor at UC San Diego, and Wesley Fraser, postdoctoral scholar were shocked to find out although Snow White was indeed red, it’s surface was also covered in water ice. “Water ice is not red! Although ice is common in the outer solar system, it’s almost always white~ Mike Brown, the Richard and Barbara Rosenberg Professor and professor of planetary astronomy. One other dwarf planet that shares these characteristics is Quaoar, discovered in 2002. Slightly smaller than Snow White, Quaoar is still big enough to have had an atmosphere and a surface covered with volcanoes that sent-up and slush and ice, which as with Snow White flowed over the surface before freezing solid. 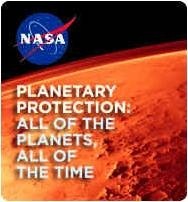 But smaller than dwarf planets like Pluto or Eris, it was unable to hold onto volatile methane, carbon monoxide, or nitrogen compounds as long. And two billion years after its formation Quaoar inevitably began to lose its atmosphere to space; now, and today all that remains is the space-irradiated methane which rests on the icy surface Quaoar’s, giving it a glowing reddish hue. It is clear from indications on the spectrum of Snow White 2007 OR10 which clearly shows the presence of water ice that it too for the last ½ billion years it has followed in the footsteps of Quaoar, still and silent amongst the stars, slowly losing its atmosphere into space until now only a small part remains." The existence of methane is still open to debate. But the use of a large telescope such as the Keck Observatory will show clearly whether methane exists on Snow White or not. If this proves to be so it will join Quaoar as one of only two dwarf planets that bridge the gap between the tiny selection of entities large enough to hold onto hazardous composites, and the smaller entities that constitute the vast majority of KBOs. 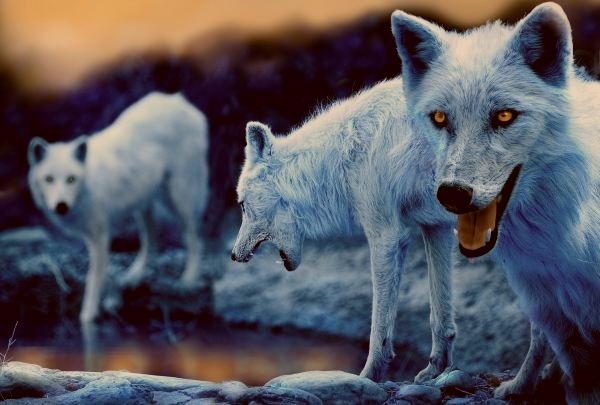 The Ice Wolves of Europa layer into this, the concept of alien evolution, the search for extra terrestrial intelligence, and the cool softness and also the harsh ruthlessness of life on an alien world. According to Greek mythology Europa was a beautiful Phoenician princess abducted to Crete by Zeus, who had assumed the form of a white bull. Zeus later re-created the shape of the white bull in the stars which is now known as the constellation Taurus. 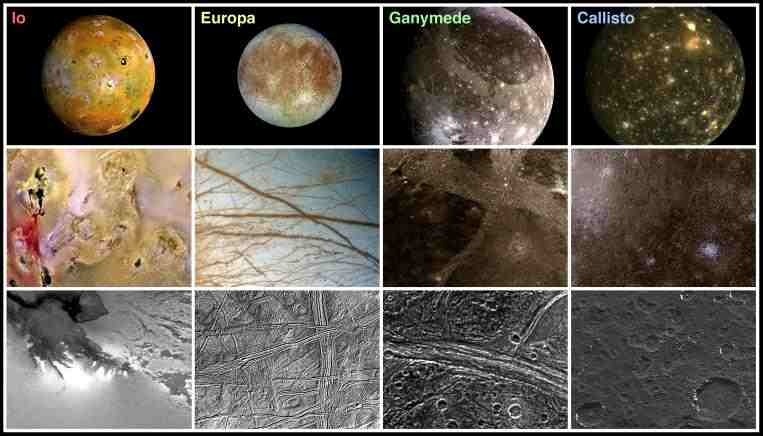 A unique and fascinating world Europa is one of a rare number of locations in our galaxy with an environment where it is possible that life may exist. 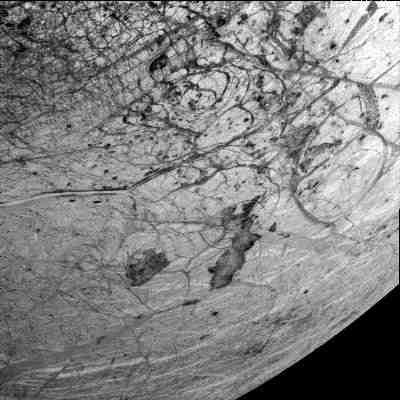 Europa is largely an icy frozen world. Its surface is one of the brightest in the galaxy, and also one of the smoothest. It is a unique and fascinating ice world and to date is unlike anything else found in the inner solar system. 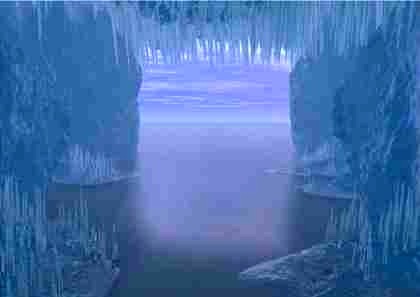 It is possible that beneath Europa’s surface ice there is a layer of liquid water. If this is so, it would be the only place in the solar system besides Earth where liquid water exists in significant quantities. The evidence is now strong for a subsurface ‘ocean’. Water is an essential ingredient for the existence of life on any world. Combined with heat and organic-rich molecules there is a heightened possibility of life originating. 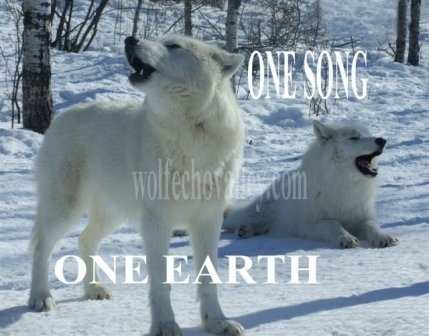 Earth’s wolves are found in a wide variety of habitats: Mountains, forests, plains, deserts, tundra and taiga. 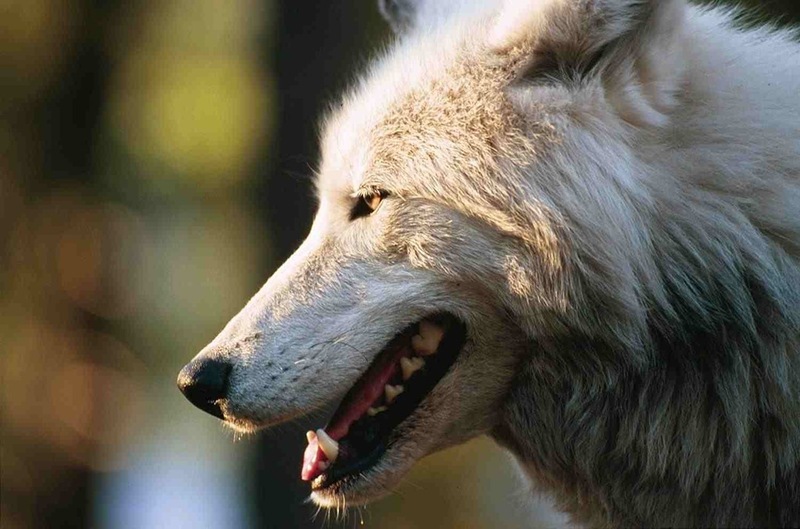 The largest North American wolves live in: West Canada and Alaska. 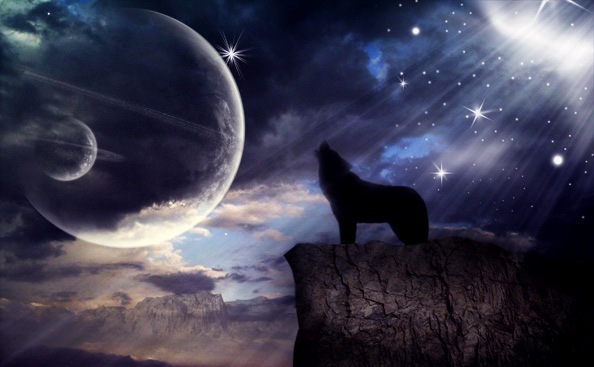 Native Americans revere the Wolf Totem in a different light. 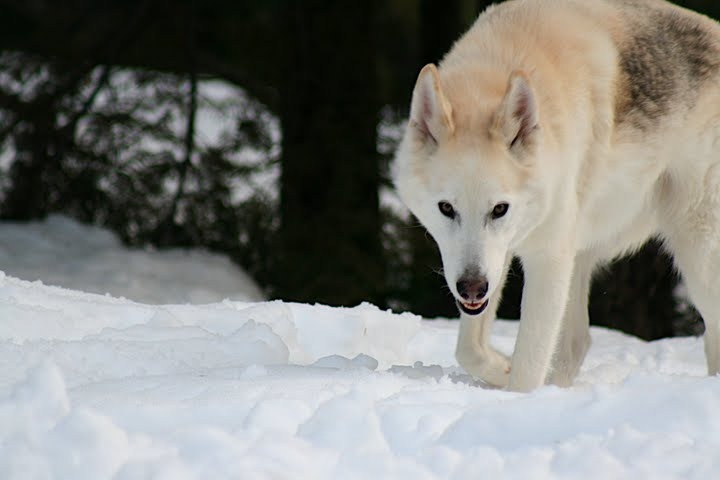 Within the Native American cultures, wolves are considered to be Pathfinders and Guardians. In parallel to this the Ice Wolves of Europa have long been regarded as Guardians of the Wolf Gates and Pathfinders of the Wolf-Ways. They are the celestial wolves, the star chasers, the ‘moon dogs of the night’ – the most direct descendants of the original Pathfinder – the one known as ‘Star of the Celestial Wolf,’ their haunting howl echoing across the wolf ways and through the rifts in time and space. Until 1977 scientists believed that all forms of life ultimately depended on the Sun for energy. With the 1977 discovery of the first hydrothermal vent, (Geysers that billow out from the sea floor.) and the teeming, diverse arrays of life surrounding its base Astrobiologists are now believe that life on Earth might have originated in the sulphurous base of hydrothermal vents. Vent ecosystems are the only system on Earth that we know of where life can thrive in the complete absence of sunlight offering an alternative way for life to meet its fundamental need for energy. They depend on microbes that tap into the geyser water’s chemical energy – energy originating from within the Earth itself. Astrobiologists have struggled for years to define the range of conditions in which “life as we know it” could exist. The discovery of hydrothermal vent ecosystems expanded that range. They were the first discovery of life as we don’t know it and suggest this is a realistic and possible scenario. The ability of life to tap such geothermal energy raises interesting possibilities for other worlds like Jupiter’s moon Europa, and ancient Red planet Mars. 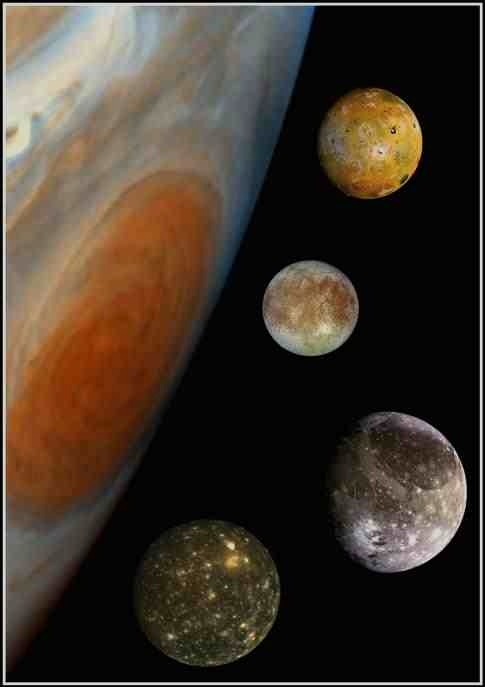 Europa is squeezed and stretched by gravitational forces from Jupiter and neighbouring Galilean satellites. Its icy surface has, gradually, broken up and reformed into icebergs, but the core is considered molten. 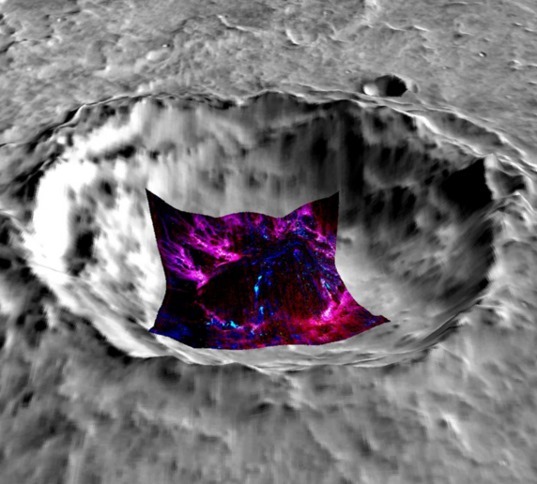 Tidal friction heats Europa’s interior possibly enough to maintain beneath the icy surface, the solar system’s biggest ocean where active hydrothermal vents are believed to exist. Astrobiologists theorize that much like the hydrothermal vents at the bottom of Earth’s oceans the ones in Europa’s dark seas be similar enough to provide all of the ingredients needed to support life.